One of the most relevant outcomes of social studies education today is the teaching of “globalization.” Failure to teach this topic situates social studies with a backward glance that prepares students for the 20th century Additionally, too often globalization in U.S. history courses is limited to an economic phenomenon or misinterpreted as a process of global ‘Americanization.’ Conversely, globalization is better taught as interconnected political, social, economic, and cultural processes and projects. 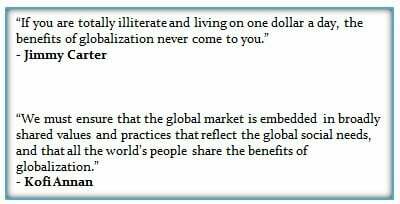 Also, globalization has a profound impact on contemporary identities, identify formation, and subsequently the formation of the “other.” The process of “othering” categorizes people from one’s own distinctiveness. Typically, the process uses qualifiers to marginalize groups as not being “authentic” and relegate collectives to inferior positions. Recognizing this cognitive practice frees students to better engage ‘globalization’, and other concepts, like ‘modernity’ and ‘culture’, with a nuanced approach emphasizing complexity and connections over simplicity and isolation. How can globalization be defined and that explanation be nuanced and problematized? What are the major systems and ideas involved in and impacted by globalization? To what extent is Thomas Friedman’s claim that the “world is flat” a valid one? What are the limits of seeing culture as static, packaged groups of beliefs, actions, and qualities? How do you teach globalization?Four educators — John T. Spencer, Diana Laufenberg, Jennifer D. Klein, and Jason Flom — have contributed responses to Craig’s question. In addition, I’ve included comments from readers. Is Sharing and Trading Across Cultures a Good Thing? How has Terrorism Changed the United States? Michel-Rolph Trouillot, Chapter one of the text, Beyond Dichotomies: Histories, Identities, Culture and the Challenge of Globalization (2002). Bill Clinton, Impact and Legacy (c. 2003). Mamood Mamdani, Good Muslim , Bad Muslim: A Political Perspective on Culture and Terrorism (2002). Taipei Times, Globalization is not Americanization (2004). TED Talk – Dr. Dean Ornish, The Killer American Diet that’s Sweeping the Planet (2006). TED Talk – Gordon Brown, Global Ethic vs. National Interest (2009). Life Expectancy Presentation from Gapminder (2010). Podcast -BBC . John and Jean Comaroff explore how communities sell their traditional culture (2010). Terrorism and the American Experience: The Journal of American History, speaks with Professor Beverly Gage, author of the essay “Terrorism and the American Experience” (2011). Video – Hans Rosling, The US in a Converging World (2011). Graphic – US Military Bases Around the World, National Post (2011). TED Talk – Pankaj Ghemawat, Actually the World Isn’t Flat (2012). Mapping the Nation: interactive map that pulls together demographic, economic, and education indicators—nearly one million data points (2012). KOF Index of Globalization (2015). NPR Podcast, A Brief History of US In Central America in the 1980’s (2016). Radio Broadcast : How the World Views the U.S. Presidential Election (2016). Web Tool – If it Were My Home: Use our country comparison tool to compare living conditions in your own country to those of another. 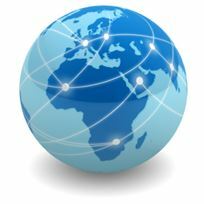 Web Tool – Global Terrorism Database: An open-source database including information on terrorist events around the world from 1970 on. Web Tool – Freedom House: Reports on Freedom Levels over time around the globe. Conference Webinar – The US In the Eyes of the Rest of the World (2017): a panel discussion among renowned experts on China, Israel and Palestine, Mexico, the Middle East, and Russia to discuss the ways in which political and social perceptions of America are changing (about 2 hours – from the New School in NYC). Mikhail S. Gorbachev’s resignation speech (1991). World Trade Organization History Project, Seattle, WA (1999). President Bush’s address to a joint session of Congress and the nation (2001). Iraq Anti-War Protests around the World (2003). Globalization and Culture, Remarks by Ambassador Frank Lavin at the Eisenhower Fellowship Conference in Singapore (2005). President Obama’s remarks in Cairo on a “New Beginning” (2009). Peter Menzel’s Material World, slideshow (2010). The World Values Survey, Data Analysis and Comparing Nations (2014).